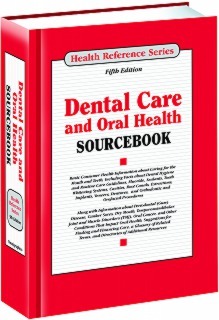 Dental Care and Oral Health Sourcebook, 5th Ed. Dental Care and Oral Health Sourcebook, 5th Edition, offers updated information about mouth and tooth care for effective hygiene, nutrition, and decay prevention in children and adults. It discusses orthodontic, endodontic, and periodontic procedures, and gives facts about oral diseases and disorders. Part I: Taking Care of Your Mouth and Teeth describes what oral health is and discusses the importance of personal oral hygiene. An overview of the mouth and dental structures is provided along with information about general oral health. Details are included about home care products to clean teeth and dental plaque, including tooth brushes, rinses, irrigation, and whiteners. The impact of nutrition and fluoride is discussed along with information about oral injuries and oral piercings. Part II: Visiting Your Dentist’s Office explains common procedures, such as X-rays, fillings, sedation, and treatments for tooth pain. Details are offered about types of dental restorations, having a tooth pulled, and the possible choices if dentures are needed. Part III: Dental Care for Specific Populations offers strategies for initiating and maintaining healthy primary teeth. Fluoride treatments, sealants, and good nutrition with adequate calcium intake are addressed. Other specific concerns for children, such as teething, sports-related orofacial injuries, childhood bruxism, and the impact of sugar-based drinks and snack foods on children’s oral health, are discussed. This part ends with a special focus on women’s oral health and oral health tips for older adults. Part IV: Orthodontic, Endodontic, Periodontic, and Orofacial Procedures offer details about braces and retainers, as well as information about treatment for periodontal (gum) disease, dental implants, and oral surgeries. Facial trauma and corrective jaw surgery are also discussed. Part V: Oral Diseases and Disorders provides information about bad breath, burning mouth syndrome, cleft palate, dentinogenesis imperfecta, jaw problems, mouth sores, oral cancer, and thrush. Disorders of the tongue, taste, and those that cause dry mouth (xerostomia), such as salivary gland disorders or Sjögren syndrome, are also explained. Part VI: Health Conditions That Affect Oral Health describes specific conditions that cause—or result in—oral complications, including cancer treatment, celiac disease, diabetes, eating disorders, heart disease, immune system disorders, organ transplantation, osteoporosis, pregnancy, and the use of tobacco or illegal drugs. Part VII: Finding and Financing Oral Health in the United States provides information on oral healthcare status and factors that impact access to oral healthcare. It reviews average dental expenses and private and public sources of coverage that assist in paying for dental care including suggestions for finding low-cost dental care. Specific information is also included about school-based oral health services. Part VIII: Additional Help and Information gives insight into the current research on oral health. It also provides a glossary of terms related to dental care and oral health as well as a Directory of local dental schools and other dental care and oral health resources.